You Make the Call: What Happens if a Tenant is Discovered to be a Hoarder? An estimated 2-5% of the population is affected by hoarding, which is the saving of and inability to part with possessions. Clutter from hoarding often disrupts the ability of a tenant to properly use their living space. 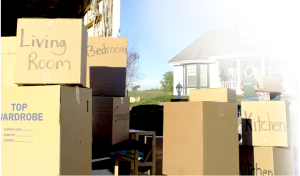 What is the Responsibility of a Property Manager if a Tenant is Discovered to be a Hoarder? According to the American Psychiatric Association, hoarding is a disability, and therefore a protected class within the Fair Housing Act. Tenants cannot be evicted based on hoarding alone, but can be evicted for breaking lease agreements and code violations such as blocking of doorways, direct damage to property, improper storage of perishable foods that can attract pests and rodents, interfering with ventilation or sprinkler systems and storing potentially explosive materials. When Real Property Management Baton Rouge inspects your property, we not only ensure the tenant is complying with lease terms and codes, but also prevent potential hoarding issues. Real Property Management is always acting on your best interest, and will do our due diligence to inspect, document and keep owners informed. Together, Real Property Management Baton Rouge and property owners can decide the best course of action in each hoarding case.